Over at Prime Time Money today he has a post about the latest meme going around – What's in my wallet? He actually took pictures of his wallet, went through and detailed everything that he carries around with him. It sounded like an interesting exercise to compare wallets – so I thought I'd give it a shot. Pete's Wallet: What is it? 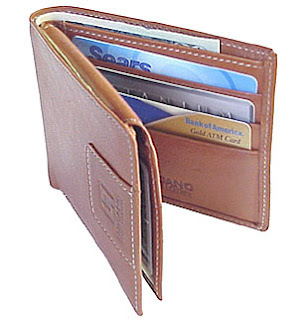 : My wallet is a nice $9.99 brown leather wallet that I got on clearance at Target when my old wallet ripped a seam. Its a bifold wallet with credit card slots on both sides, and two money/receipt slots in the top. It even has a nice little slot to hold your extra house key in one of the money slots. I'd never seen one of those before I got this wallet. Pete's Wallet: What's in it? : Here's whats on the inside of this thick wallet. TCF Bank Visa Card number 4777-3329-4444-5555. Oops, never mind that last part. Scott County Library Card: Big money saver here. Body shop business card: I had an accident recently. Best Buy credit card and reward zone card: I use the reward zone card, but haven't used the best buy credit card in 6-7 years. RFID Badge to get into work. NOTHING.. not even a receipt. (ok, in the picture above, it has $80 in it. I just got cash) I just cleaned my wallet out the other night in preparation for a trip to San Francisco. Which reminds me, I better get cash before I leave, I hear it's expensive there. So there you have it. Those are the contents of my wallet. Zero dollars and zero cents, a credit card, a debit card and a bunch of other miscellaneous things. PTMoney.com – What's in your wallet? Free Money Finance – What's in your wallet? My Open Wallet – What's in your wallet?